Seoul's international food scene has really diversified in recent years from the familiar Indian and Mexican joints to harder-to-find cuisine such as South African and Belgian. Imagine my pleasant surprise then when I was strolling about my growing favorite neighborhood of Yeonnamdong, just by Hongdae, with some friends one night and we stumbled across a place specializing in Taiwanese cuisine of all things! My first (and sadly so far only) trip to Taiwan was a few years ago when I went with one of my best buds (a knuckle-headed Taiwanese-American) from my university days to check out his motherland. From the famed night market to roadside restaurants and more, I have fond memories of all my eats there. This longing was sadly unfulfilled for many years until I stumbled across these side-by-side Taiwanese joints and was I glad I did. I'm not sure why they have two signs for their store- Bao tsu mama and Dae man ya shi jang (not sure about any Romanized English spelling but these are the Korean pronunciation of the Chinese character)- but the restaurant itself is essentially one for both. As the "bao" name implies, the first one specializes in Chinese style dumplings, specifically the big ol' bao kinds- while the latter has a slew of Taiwanese snacks and eats that you'd just as easily find in Shilin or Ximending. 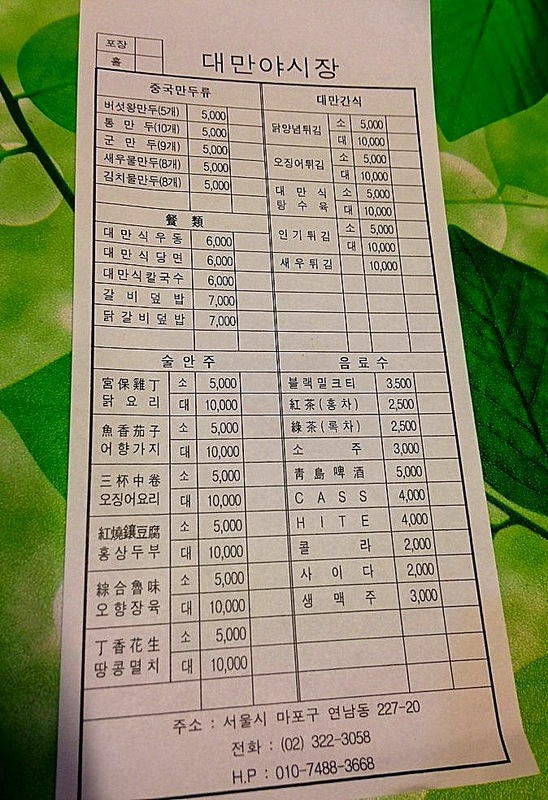 But what is absolutely insane about both places is the price - everything is priced between 5,000 to 10,000 won! Yes, inflated for what you would pay off the streets of Taiwan but that price for food in Seoul, let alone non-Korean food, is absolutely mind-boggling. They even seem to have daily specials with menu items that drop as low as 2,500 to 3,000 won. WHAT. I can't even. The menu is pretty extensive and is more or less divided into different kinds of dumplings, noodle/rice dishes, and snack food. The noodle dishes are unfamiliar to me and don't seem to be the common Taiwanese beef noodles and whatnot. They're listed as guo shao wu long mian (described as "Taiwanese style udon"), guo shao dong fen (described as "Taiwanese style dangmyeon"), and guuo shao mi fen ("Taiwanese style kalguksu"). Based on the pictures of other Korean bloggers who have visited and ordered these noodle dishes, they all seem to be a clear broth, hotpot style kind of soup noodles (as evident by the "guo shao" in their names). I don't seem to get any results on Google about these dishes in Taiwanese cuisine so anyone familiar with these dishes or Taiwanese food in general, feel free to help me out! The rice items are familiar to me though and your options are either the pai gu fan (Taiwanese pork chop over rice) or zha ji pai fan (Chicken cutlet over rice). All the noodle dishes are 6,000 won and all rice dishes are 7,000 won. The snack items include the beloved Taiwanese style popcorn chicken (yansuji or 鹽酥雞), fried squid (jiaoyan youyu or 椒鹽魷魚), Taiwanese style "tang soo yook" (I believe this one is a form of gua ba rao or 鍋包肉 but not sure...), inki twigim (not sure but other blogs seem to indicate it's an assortment of fried fish cakes? ), fried shrimp, fried tofu, braised eggplant, and more. All the snack items are priced at either 5,000 won for a small size and 10,000 won for the large size with the exception of the fried shrimp which is strictly 10,000 won. The dumpling options are five and include mushroom bao (5,000 for 5 fist-sized baos), steamed (10 for 5,000), fried (9 for 5,000), steamed shrimp (8 for 5,000), and steamed kimchi (8 for 5,000). Drink options are extensive with not only Tsingtao (5,000 for a large bottle) and Cass and Hite (4,000 a bottle) offered but red and green tea (2,500), black milk tea (3,500), soju (3,000), and soft drinks (2,000). However, the restaurant takes great pride in the food it makes and they reiterated a few times that they make everything from scratch. A portion of the restaurant is even dedicated to making dumplings and you can watch the ladies expertly operate as essentially a dumpling factory. The dumplings are placed on trays that pile mountain-high at times, ready to be steamed/fried for eager patrons. Like many of the spots in the up-and-coming Yeonnamdong, the place was PACKED but luckily didn't require the 3 of us needing to wait very long. Despite the fact we had eaten right before, we were too enticed not to eat and we made orders for the Taiwanese style tang soo yook (small portion), Taiwanese style popcorn chicken (small portion), the mushroom baos, and a few Tsingtaos. As the waiter prefaced, this place's version of tangsooyook is not at all like the Korean-Chinese hybrid Koreans are used to. For starters, the meat comes with no sauce. The battered, seasoned, and fried meat slices are instead stir fried with chopped garlic, basil, and green beans. The seasoning is in the batter which is not crisp like the Korean hybrid but softer and more delicate. Despite the absence of sauce, it's plenty flavorful from its spices as well as the garlic and basil while the expertly stir fried green bean slices and garlic provides the snappier crunch to contrast wonderfully with the meat bits. The Taiwanese fried popcorn chicken, in contrast to the tangsooyook, has a crunchier exterior in spite of having a significantly lighter coating to the meat pieces. The familiar 5-spice taste and fragrance, combined with pepper, garlic, and other seasonings really transports you back to Taiwan momentarily while the chicken itself is moist and flavorful from its pre-fry seasoning. It would have been nice to see more fried basil leaves in it but as it's not an herb so prevalent in Korea, I suppose I should be grateful any of it made it into the dish at all. All the dishes are clearly made to order including the bao buns which took quite a while to come out. These fist-sized babies came steaming from their steaming and ready to be devoured. Just look at those beautiful ridges! For many purchased baos (or wang mandu in Korea), they tend to be mostly bun and little filling but the ones here thankfully bucked this trend. Tearing into the bun released a puff of steam which then revealed this glorious sight of minced bok choy, meat, chives, noodles, and big slivers of mushroom slices. Though soy sauce is provided on the side for dipping, I didn't feel the need for it and I relished in the varying taste and textures of the filling and the soft yet chewy house-made bun. So humble yet guiltily addicting. And how can it NOT pair well with the Tsing? As I said before, we had already eaten dinner before so it's embarrassing how well we devoured everything down. In addition to its taste, non-Korean flavors, attention to detail, we kept marveling at the low prices and how we would kill to have a place like this closer to where we respectively lived. Whether looking for a homely meal or grabbing a beer and snacks with friends, Bao Tsu Mama and Taiwan Night Market (Daeman Ya Sijang) is just the thing to get a taste of Formosa in Seoul! "Humble" is the key word here for everything from its interior to food but sometimes straight and simple is all you need and more for a fantastic dining experience. The food is good, the prices are unbelievably exceptional, and you can tell they have a lot of pride and love in the food they make. This is about the closest you'll get to Taiwan in Seoul aside from jetting off to the glorious island yourself. It's a bit out of the way to get to, especially for those who are primarily reliant on subway stations for bearing but it's in the trendy and buzzing Yeonnam-dong, a favorite neighborhood of mine, so it gives you a good enough excuse to explore the area! 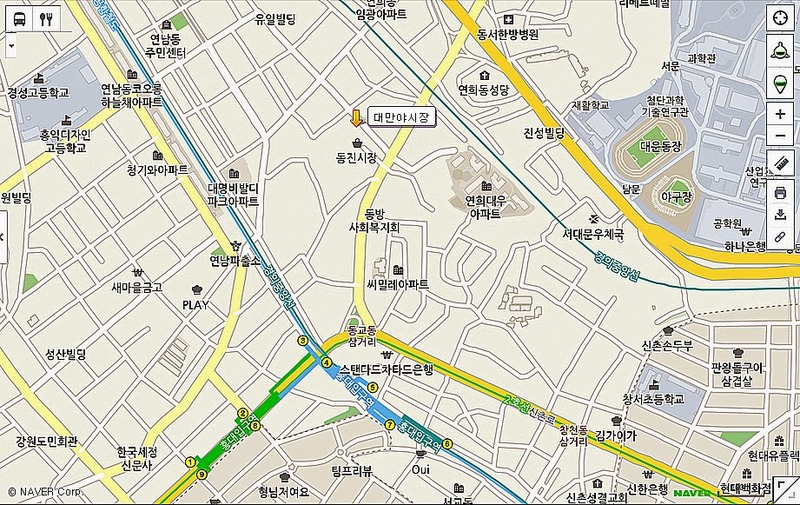 A bit difficult to find (especially if it's your first time in Yeonnam-dong) but I'll try and explain the best I can. Immediately after coming out of Hongdae University Station's exit three, turn around and walk to the big main street in front of you (it'll only be about 25 meters). From the main street turn left and follow the road as it curves around the big 3 way intersection and keep following the road for about 325 meters (you should pass a BBQ Chicken on your left along the way) or so until you get to a big 4 way intersection with a church on the left. Turn left into that street and follow along it for about 70 meters and you should see the two restaurants, side by side, on your left (refer to the pictures above for the restaurant signs). Alcohol: Makgeolli, soju, bottled beer and Tsingtao available. There seems to be a daily special they offer with dirt cheap prices... around 3,000 won or so. It should be posted on the signboard outside but if not, ask!